Glacier National Park winter photography. This glacier park winter photograph is an example of the type of image you can expect to capture during the winter months. 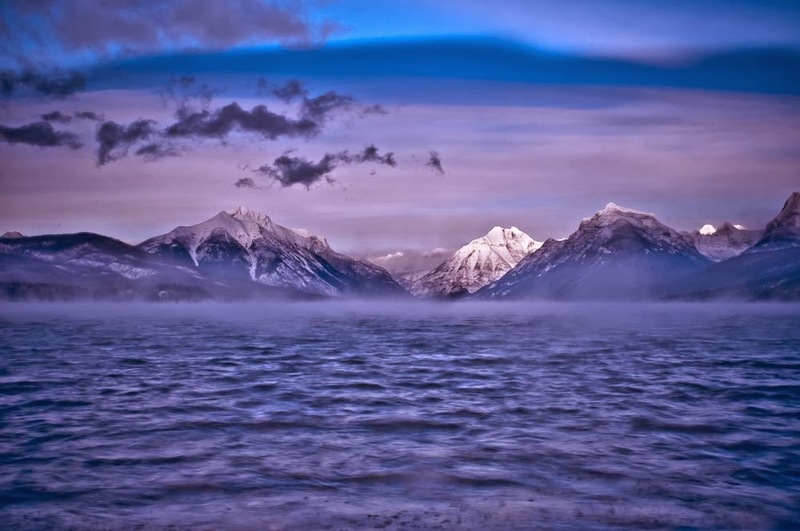 This image of Lake McDonald, is from Glacier Parks West side. Lake McDonald is a few miles north of the town of West Glacier, and about 20 miles north of Kalispell, Montana. In the photograph of Lake Mcdonald, in Glacier National Park, steam gently rises off the lake indicating very cold air and relatively warm water. In the distance, the mountains are snow capped and reflecting afternoon light. During the winter months very low sun angle makes for fantastic afternoon and evening sunset images. Lake McDonald, on Glacier Parks west side, is one of the few locations that can easily be photographed. The west side of the park has far less direct access in the winter than the east side of Glacier Park. That said, if you plan to access Glacier National Park in the winter, be sure to contact glacier park to check on area and seasonal closures. In the last few years, Glacier Park administrators have close several very popular winter access areas in response to resource concerns. In particular the entire area around Saint Mary's Lake, on Glacier National Park's east side has been closed to protect wintering elk. This closure was in response to an elk poaching incident. It's too bad the Park keeps closing more and more of the Park to visitors. Glacier National Park is wonderful area to visit during the winter. I hope that if you want to visit the park in the winter you do it! Contact +Tony Bynum , or @tonybynum or find him on facebook at Tony Bynum Photography on Facebook.